We are having our wedding in my families hometown however still about 90% of the guests are going to be from out of town (with most coming from a different state). Because of this we want to do a welcome get together the day before to spend time with our guests. We want it to be super casual (will have beer and pizza provided) with guests being able to come during the time-frame and drop in and say hi, eat, and socialize, etc. However since it's mid-afternoon (1-4pm) and just pizza, beer and soda i don't want to call it a lunch or dinner. What sounds better, Welcome Party, Welcome Social, Meet & Greet? We definitely don't want 2 receptions so we want this to have a VERY casual feel (it's at the stable's clubhouse, we will have corn-hole and pool set out). 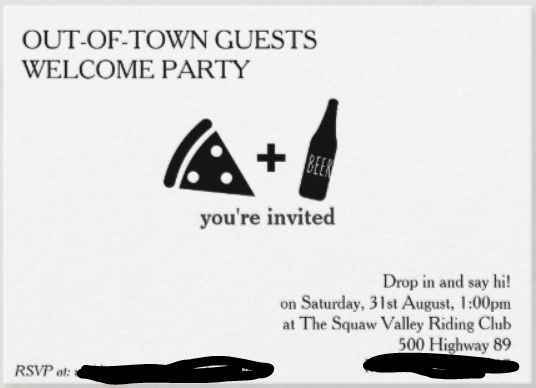 Also, we are going to put the invites for the welcome party in with the real invites, which one do you like best (see below)? Thanks for all the help in advance! I like the layout of the second one, but “Welcome Party” better than Social. I like Option 2, and I agree with Jennifer that "Welcome Party" is better than Social. I like the layout for number 2 but I also like welcome party better than welcome social. I don’t know if I like to have out of town guest specially if you’re sending to everyone. I do recommend to have the time frame so everyone knows they don’t have to be there at 1 pm on the dot. I like the second option, then the third option. I like the layout of the last two but I like "welcome party" better, I don't think it has to specify out of town guests though. I really like option 1, and I think Welcome Party sounds the best. I like option 3 but I would change it to "Welcome Party" and take out of the line of "out of town..."
I would remove "out of town" guests. It would be super weird to open this event to 90% of your guests and leave out the other 10% just because they live close. Hey Kristen! This is such a nice idea! I agree with some of the previous comments, "welcome party" sounds good and you can remove the "out of town" guests wording. Personally, the 2nd and 3rd options are my favorites! Thank you everyone for their advise! In regards to the "out-of-town guest" part we were planning to only include them with the invitation for those who are travelling (so only those invited/out-of-town guests would see it). We are toying with the idea of inviting everyone though, so if we do decide that i will definitely get rid of "out-of-town guests". I like #2 but I think the “out of town” looks awkward. I don’t think you need it. Just say welcome social or welcome party without the out of town specification. I really like the first one with the pizza and beer pictures, it’s cute. I would probably just call it a “welcome party” and not specify that it’s for out of town guests. I think with invite wording the simpler the better. Such a cute idea! Option #3 is my personal favorite. I'm also having the vast majority of my guests come in from out of town, but am taking a slightly different approach due to some family-specific logistics. We'll be doing a pre-party event two months before the wedding date, as my family does an annual Summer vacation in the area. I imagine lots of family won't be able to make it back up for the wedding, so I wanted to give people something a bit easier to attend. We're thinking of getting a taco truck so we can do something lowkey, but delicious and fun. Even if you are only giving them to out of town guests, I don't think the wording is needed on there! With these things, less is usually more. They're all really cute and creative though! I like option 4. It's a bit more on the playful side with the font that you have which would tie in well, i think, with the more casual feel you were going for. I'd call it a Welcome Party. I also like the second one, but with "Party" instead of "Social". We are doing this as well. Decided to call it a "Welcome Shindig". That way people weren't expecting a fancy dinner, and so they knew it was casual. I love that! Shendig also just sounds fun! I love option 1. Since it's casual I'd go with "Party" over "Social". We are actually planning on doing something very similar! We're doing a beach party grill out with corn hole, giant connect 4, giant jenga, and of course beer and other drinks. It's in Key West so we actually named our welcome party "Cheeseburgers in Paradise". Whatever you choose it'll be perfect!